Proud partners! We are thrilled to announce our next community. 80 New Stories in the making. the stage at Inman Connect to share the exciting news. SAN FRANCISCO and MADISON, N.J., Aug. 2, 2016 /PRNewswire/ — Better Homes and Gardens® Real Estate and New Story, a certified 501(c)(3) non-profit organization, today announced a strategic alliance to bring the dream of homeownership to hundreds of people in Ahuachapán, El Salvador, through the development of a crowd-funded community. The community made possible by Better Homes and Gardens Real Estate fundraising will have a significant impact on the people of Ahuachapán. Currently, residents live in dilapidated tent structures, making living conditions dangerous, resulting in harmful impacts on individual health and well-being. With life’s basic needs unmet, families are living in survival mode, precluding children from attending school and parents from holding and maintaining jobs to empower their financial future. During the construction of the community, all labor and materials will be sourced from the area, effectively creating jobs and injecting capital into the local economy. Philanthropic in mission and technological at heart, New Story enables Better Homes and Gardens Real Estate franchisees and affiliated agents to set up personalized fundraising pages to contribute to a single family home or a portion of the community, which they can share on social media or through other marketing channels. As donations are made, donors can see precisely where their funds are going and track the progress of their fundraising. This gives members of the Better Homes and Gardens Real Estate network a way to be directly and personally involved in the development of the community, with their own friends, family and sphere of influence adding to the achievement of this important goal. New Story’s innovative philanthropic model embodies two of the values that today’s consumers, particularly Millennials and Gen X, most appreciate: authenticity and transparency. 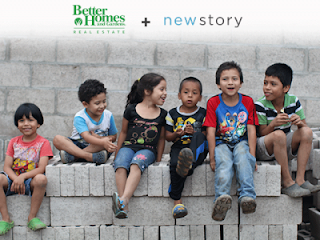 100% of donations to New Story raised by Better Homes and Gardens Real Estate, its franchise network and consumers, as well as members of their social networks, will be directly applied to the construction of the homes in Ahuachapán. New Story’s pay-it-forward model creates a true sense of ownership for the residents of its communities. Donations generated by the Better Homes and Gardens Real Estate brand, its franchisees, affiliated agents and consumers will go to fund the construction of homes in the community of Ahuachapán. It requires approximately $6,000 in donations to build each new home. Beyond that, each new homeowner will receive a title and deed to their home, along with a no-profit, no-interest mortgage, complete with a personalized payment plan to help the homeowner pay off the loan over time. This money will be reinvested into the community by funding additional homes and community infrastructure. The New Story model creates a true pride of ownership in the homes and in the community. Launched as part of the Y-Combinator Summer 2015 class of start-ups, New Story was also honored as the 2016 Realogy FWD Innovation Summit winner in June for presenting the most innovative technology product or service designed for the real estate industry among the 15 emerging technology companies who were finalists. To learn more about or contribute to the Better Homes and Gardens Real Estate and New Story community, visit bhgre.com/newstory. 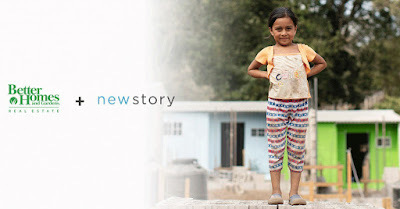 New Story is a 501(c)(3) nonprofit that crowdfunds houses for approximately $6,000 and transforms slums into sustainable communities. New Story identifies a slum where families are in danger, and then works with local partners to secure nearby land and build new communities of 80 to 300 homes. New Story uses partners to design holistic communities that offer education, clean water and sanitation, access to health care, and income opportunities. At New Story’s website, donors digitally meet exact families in need, 100% of funds raised go to home construction, and donors receive move-in-videos of the families helped. New Story has funded more than 400 homes and is currently working in Haiti, El Salvador, and Bolivia. Better Homes and Gardens Real Estate LLC is a dynamic real estate brand that offers a full range of services to brokers, sales associates and home buyers and sellers. Using innovative technology, sophisticated business systems and the broad appeal of a lifestyle brand, Better Homes and Gardens Real Estate LLC embodies the future of the real estate industry while remaining grounded in the tradition of home. Better Homes and Gardens Real Estate LLC is a subsidiary of Realogy Holdings Corp. (NYSE:RLGY), a global leader in real estate franchising and provider of real estate brokerage, relocation and settlement services. The growing Better Homes and Gardens® Real Estate network includes more than 10,000 affiliated sales associates and approximately 300 offices serving home buyers and sellers across the United States andCanada. Better Homes and Gardens® is a registered trademark of Meredith Corporation licensed to Better Homes and Gardens Real Estate LLC and used with permission. An Equal Opportunity Company. Equal Housing Opportunity. 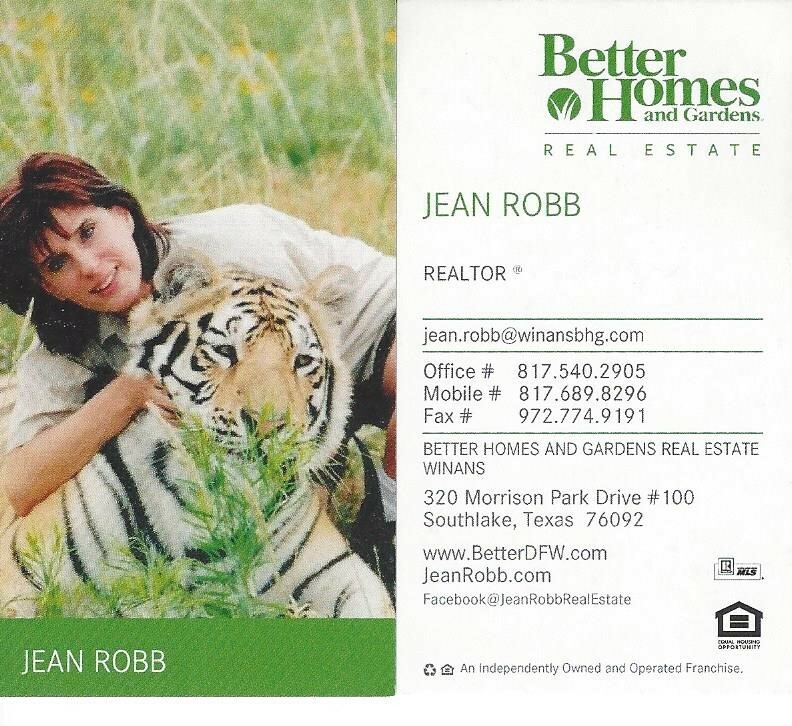 Each Better Homes and Gardens Real Estate Franchise is independently owned and operated. For more information, visit www.BHGRealEstate.com. I'm so proud to work for a company that realizes how important it is to give back!